Doubts on search results and ranking flux early in May? Cleared. The roll out of Panda 4.0 update? Confirmed. The list of the biggest losers and winners? Seen. So, what’s next? Well, it’s time to take steps to recover from the Panda 4.0 penalty, and create content that is Panda friendly. 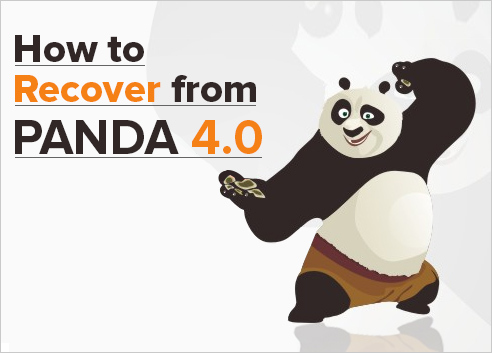 We have come up with the complete story of Google Panda 4.0 update, how did it affect websites, and what you can do to recover from the Panda 4.0 penalty. We have also prepared a list of guidelines and tips that will guide you to have a Panda proof content strategy. But before jumping into it, here’s what you must know about the new Google algorithm- Panda 4.0. It was in 2011 that Google first rolled out the Panda algorithm as a step to boost the rankings of websites with quality content and prevent the low quality content from reaching the top positions in the search results. Google has already made 25 refreshes in a span of 2 years before Panda 4.0. Although Google has stopped updating us about Panda refreshes after they started rolling out one every month, there was something big about the 4.0 update which made Google talk about it. Panda 4.0 was an update to the original algorithm rather than a mere refresh, affecting about 7.5 of English queries. That is why Panda 4.0 had a greater impact on major websites. While Panda 4.0 brought serious trouble to the sites with low quality content, it rewarded others for standing in line with the norms of Google. How Panda 4.0 Affected the PR Sites? Google has frequently indicated it is not much pleased with the press release websites. Matt Cutts once stated, Google regards press releases as owned content and links in them are not considered of much value for SEO. Last year Google also updated the Webmaster Guidelines, asking webmasters to remove links with optimized anchor text in press releases. Following the Panda 4.0 update, major wire services lost a great amount of traffic as well as online visibility. A major PR website lost more than half of its traffic within a single day. Individual press releases lost almost all rankings in search results. So what does this mean for those companies which use the PR wire services? If your company has been releasing press releases in the right way, you will just do fine. Google wants the search results to show natural and organic web pages which provides useful information to the users. Anything which tampers with the Google algorithm can be dropped from the search index. This is why the Panda 4.0 update led to a drastic fall in the rankings of all those press releases which employed spammy link building tactics. 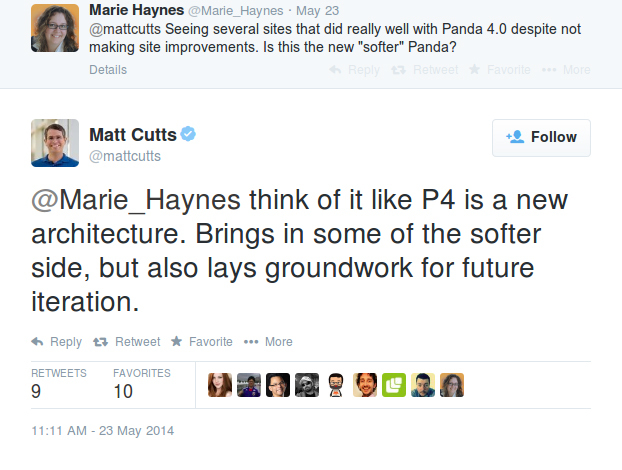 What the Panda 4.0 Update Taught Us? Concentrate on Unique Content: Focus on the creation of 100% original and unique content. Duplicity of any form, onsite or offsite, is hazardous, and Google penalizes sites with duplicate content strictly. So make sure your content is in alignment with the Google norms. Topical Authority Content: Rather than a generic all-inclusive site, be more of a topical authority in your niche. Content based topical authority websites get more online visibility as compared to those which provide only a brief description of the topic. If you write more articles on the same topic, it increases your chances of being called a “Topical Authority Content Site” for that particular topic. Powerful Content Strategy: Work on a powerful content strategy to focus on all the pillars of SEO including social, email, PR and PPC. We recommend building your brand with unique content, high quality links, and a powerful social strategy. Determine Your Target Audience: Your content must have a target audience. It should serve a particular group. Don’t just write on anything and everything. Choose a particular domain and then serve the concerned group. Engage Your Audience: Writing is a form of storytelling. Your content should be such that the reader can easily understand it and connect with it. This will help them engage with your content. Ditch the Old Low Quality Content: Remove the old low quality content from your website. Do away with duplicate or thin content and consolidate pages. Incorporate a site audit for content and surf volatility. Look for spelling and grammar errors. Asksomeone else to do the quality check for you. Break up long paragraphs into several smaller ones. Use headings, subheadings, lists, and relevant images to simplify the content for your audience. Finally, make sure that your content is easy to find, navigate and share. Look into the Frequently Asked Questions section and determine which of these queries you can expand to create a detailed article. Instead of writing five small articles on almost the same topics, write one lengthy article combining all of them. You can also add an inbound link after each of the query which directs the user to the relevant article in your blog. Ask your customer service department about the type of queries they receive everyday and use these queries as ideas to write articles which provide standard solutions to the readers on most common problems. However, there’s another side of the coin too. Apart from punishing the websites with poor quality content, Panda 4.0 has also rewarded those websites which had unique and quality content. PageTraffic always had a strong content creation strategy that is why our clients were not affected by the Panda 4.0 update. Because we have always focused on creating high quality content, not much has changed for us. In fact with the Panda 4.0 update many of our clients’ rankings and organic traffic increased. Also, the businesses, which were playing by the norms of Google but were still punched hard by the earlier updates of Panda have got their rankings back. But there are still some chances that the list of winners and losers might change and more changes could be awaiting us in the coming weeks. As of now, the only thing which is certain is that, if you keep working on the quality content, providing readers something worth reading and sharing, you will no doubt be rewarded by Google. Hopefully, this will help you get things back on track. We will keep you updated as more information rolls out. In the meantime, you can leave your comment below if you want us to help you make your content creation strategy panda proof. We would love to hear from you. Just want to ask one more things – Do you think that the length of a content or article has any significant ,Does it send a positive signal to the Google ? help me in this regard.